NEXT month, the Temple of Baal will come to Times Square. 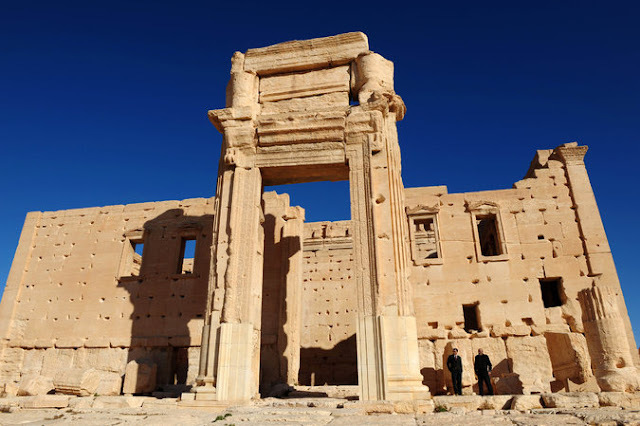 Reproductions of the 50­foot arch that formed the temple’s entrance are to be installed in New York and in London, a tribute to the 2,000­year­old structure that the Islamic State destroyed last year in the Syrian town of Palmyra. The group’s rampage through Palmyra, a city that reached its peak in the second and third century A.D., enraged the world, spurring scholars and conservationists into action. Numerous nongovernmental organizations are now cataloging and mapping damaged cultural heritage sites in the region. It will be uncanny and thrilling to see this arch from an ancient desert civilization set against the bright lights of New York. Unfortunately, facsimiles can achieve only so much. Denuded of people, stripped of the rich social contexts in which they were once embedded, antiquities appear just as evidence of the grandeur of the past, the accomplishments of another place in another time. But what did these assemblages of stone mean to the modern Iraqis and Syrians who lived with them? For Salam al­Kuntar, a Syrian archaeologist who works at the University of Pennsylvania Museum, the loss of the Temple of Baal was deeply personal. “I have a special love for Palmyra because the Temple of Baal is where my mother was born,” she said. Ms. Kuntar’s grandfather was a policeman in Palmyra when its Romanera ruins were inhabited. Well into the 20th century, generations of Palmyrenes made their homes in the shade of millenniums­old columns. The locals taught Ms. Kuntar’s grandmother — who was a young bride when she arrived in Palmyra — how to cook and how to bake bread. Her daughter was among the last generation born inside the ancient city. In the late 1920s and early 1930s, French colonial authorities cleared the area of its inhabitants and dismantled their mud­brick house. That paved the way for the archaeological exploration and preservation of the site, but it also definitively ended ancient Palmyra’s habitation as well as the use of the Temple of Baal, which over the centuries had transformed into a Byzantine church, then a mosque, before eventually becoming part of the village where Ms. Kuntar’s mother was born. When lamenting the masonry and sculpture destroyed by the Islamic State, we can easily overlook this shifting human story. We too readily consign antiquities to the remote province of the past. But they can remain meaningful in surprising and ordinary ways. “This is the meaning of heritage,” Ms. Kuntar said. “It’s not only architecture or artifacts that represent history, it’s these memories and the ancestral connection to place.” Bulldozed by the Islamic State in 2015, the 1,500­year­old monastery of St. Elian, near Al Qaryatain, Syria, was a symbol of these connections. It was a modest and unadorned structure that had none of the glamour of the Temple of Baal; a 3D reconstruction of the rather plain sarcophagus that held the remains of its eponymous saint won’t be coming to a major Western city any time soon. But its importance lay in its role as a bridge between communities. Al Qaryatain is a small town in the desert between Palmyra and Damascus. For centuries, Christian and Muslim pilgrims alike came to the monastery to seek the blessings of the saint. Muslims venerated St. Elian as a Sufi sheikh, known to them as Sheikh Ahmed the Priest. His tomb was draped in the green satin common to Sufi holy sites. Until the turbulence of the civil war, the monastery hosted the festival of Eid Mar Elian every Sept. 9. Five to six thousand devotees — Muslim and Christian — would converge on the monastery, where under a large tent erected in the central cloister they would swap tales about St. Elian/Sheikh Ahmed, share plates of lamb and rice, and dance the dabka. In attacking the monastery, the Islamic State was not simply leveling a holy place. The militants struck at a site that had knit Muslim and Christian communities together for centuries. Local legend has it that centuries ago, the townspeople decided that no matter whether Islam or Christianity gathered more believers, the group in the majority would always protect the one in the minority. Generations of pilgrims left affectionate graffiti on the sarcophagus of Mar Elian, including a Star of David suggesting that at least one Jew visited the saint. Another instance of revealing graffiti can be found on an antiquity destroyed last year in northern Iraq. After the Islamic State seized Mosul in 2014, important archaeological sites fell into the group’s hands. These included the ancient Assyrian city of Nineveh, which the Islamic State pillaged in 2015. One of the antiquities demolished at Nineveh was an enormous figure of a “lamassu,” a winged bull with the torso of a man and the beard of a king. It was a protective deity that watched over the Nergal Gate, a major entrance into the city. The lamassu was probably installed during the reign of King Sennacherib, who ruled from 705 to 681 B.C. He was an expansionist leader under whom Nineveh became the capital of the Assyrian Empire. The muscular iconography of the lamassu matched Sennacherib’s imperial ambition. Before smashing the sculpture, Islamic State fighters chiseled off its face with a pneumatic drill. The winged bull carried the history not only of kings, but also of ordinary people. Archaeologists had noticed webs of lines scratched into the plinth of the lamassu. These markings, they determined, were the traces of a board game, possibly a version of the ancient Mesopotamian pastime known as the Twenty Squares, a descendant of which is still played in Iraq today. Bored Assyrian guards probably played as they whiled away their shifts. On the surface of a grand political statement, they left the irrepressible evidence of humbler life. We should not think of the destroyed or at­risk heritage sites in the Middle East as history frozen in stone. It is, of course, worthwhile to study their structures, to resurrect them digitally and even raise them in the metropolitan plazas of the West. But those efforts will be hollow if we forget how antiquities have remained present in the lives of Iraqis and Syrians right up to this grim modern era of destruction.